■■ get on your bike for isabel hospice! ■■ The Bish Bash 2019 . . . AND MUCH MORE! SPRING OFFERS! OFFERS! JANUARY EARLY BIRD SPECIALS CHEAP CHEAP CHEAP!!! Many of you know that the group that ran the Herts & Essex Observer & Harlow Star stopped publishing a printed version in February. Fortunately, Stortford still has the awesome Independent and long may that continue! Did you know that we are the only printed, free publication that is delivered to the whole of the Town? We have 17k copies printed and split the delivery over two months. As long as we can access a letterbox, we will deliver to it - we do not cherry pick areas. As a community magazine, that’s not what we’re about. In our 2018 customer and resident survey 100% of customers and residents said they would recommend us and 83% gave us 10/10 for customer service, no one gave less than 8/10! I don’t say this to impress you but to impress upon you how dedicated and dependable we are. Put simply we care. I care. Community is everything. And we’ll keep doing what we do as long as we’re needed. So please do consider using the businesses and organisations in the magazine and tell them that you saw them in CM23 but above all, please keep it local! 28 Get on your Bike for Isabel Hospice! 36 Listings 38 Useful Numbers The CM23 Connection cannot be held responsible for any errors or omissions, products or services that appear in this publication. Purchasing a new home or commercial property for your business? Need advice on family matters or require a will to protect your loved ones? Our friendly lawyers, previously known as Breeze & Wyles, have offices in Bishopâ&#x20AC;&#x2122;s Stortford, Enfield and Hertford. We provide jargon free advice for individuals and businesses to successfully overcome legal hurdles in life and in business. local business people in person Name and Business: My name is Daniel Stockley and I run Ed’s Gardens Services. Where do you live? I live in Harlow. What’s your favourite shop? GR8 Tool hire - Very helpful and reasonably priced tools. What’s your favourite Venue? Pircio - Always good service and tasty food. What do you like best about Stortford? The nightlife in Stortford is good, bit of something for all age groups. What do you like doing when you’re not working? I like to ride along the river and do some cooking at home as I used to be a chef. Also getting out in the garden, obviously! I set up my business because... I’ve been a chef since I left college and wanted to be more outdoors, clearly didn’t think too much about the British Climate! What’s the best thing that’s happened to you recently? Winning a pub quiz with my mates! What’s your favourite one liner? The early bird might get the worm, but the second mouse gets the cheese. St Elizabeth’s centre LOOKING AHEAD “St Elizabeth’s is a vibrant community supporting people with epilepsy and other profound disabilities towards an independent and fulfilled life. It is – and I can say this because I have only recently joined it – a truly amazing place, combining the best of new therapies and technologies with a century-old tradition of care and expertise. But we are not standing still. As a new CEO of a newly independent charity, I am eager to help us develop even further: expanding our reach and deepening our offer. The next few years for St Elizabeth’s will be very exciting. We hope you can join us on our journey!” – Adam Sampson, new CEO of St Elizabeth’s After a successful 2018, St Elizabeth’s are moving into 2019 with fresh and exciting new challenges, a new Chief Executive, a new website and as a new, independent charity! 2018 saw us host a number of popular events, such as the annual Summer Fayre, Apple Day, Charity Golf Day and Christmas Bazaar. Apple Day was hosted by the famous face of BBC DIY SOS, Billy Byrne! The celebrity opened our orchard to the waiting crowd, and met with lots of families, friends and residents of St Elizabeth’s. Billy returned for the Christmas Bazaar, opening the ever popular Santa’s Grotto with a little help from Sparkle the reindeer. Are you looking to take on a challenge event this year? Could you do it for St Elizabeth’s? There are lots of ways to get involved, including the London Marathon (2020 ballots open to run for us! ), Ride London or even abseiling! We still have some 46 mile places left for Ride London, taking place in August 2019. We also open our Corporate and Community groups volunteering programme in April, where corporates are invited to take part in volunteering opportunities involving maintenance, general tidying and painting. All of these tasks help keep St Elizabeth’s looking beautiful and enable all residents to enjoy during the warm summer months. Did you know? •	St Elizabeth’s is one of the largest employers in Hertfordshire, employing over 650 staff! •	St Elizabeth’s supported 240 people in 2018! Successful fundraising and support from far and wide meant our School will now benefit from a fantastic new playground! The playground has been in a state of disrepair and as a result, lots of the children have missed out on recreational and therapeutic activities. However, a new surface (fundraised for by kind supporters!) will enable the children to get back to taking part in the activities they so enjoy. National wills and Probate Ltd know what is around the corner. I see families every week who are struggling because a loved one failed to plan for their illness or death and it causes consider grief and upset for those left to pick up the pieces. What hurdles have you faced? When I first started up I asked my dad, who has been self employed for 40 years, how best to advertise and attract clients. His advice was that word of mouth recommendations is by far the most effective method and he was right! So my biggest hurdle was finding my first few customers to spread the word. What has been the most challenging aspect of owning your own business? Achieving the right work/life balance. I rarely switch off and am often writing Will or answering emails at evenings, weekends and whilst on holiday because I want to provide the best possible service. However, this often means I end up neglecting those at home! What has been the most rewarding aspect? Building a relationship with my clients and giving them piece of mind. Are you the only employee? Yes, although I do have self employed associates who work alongside me. Do you hope to expand your business? Yes â&#x20AC;&#x201C; I am hoping to recruit associates with an interest in legal work and estate planning to work alongside me across the Eastern region. What do you like most about being selfemployed? The flexibility it provides me. Any interesting stories from your working life that youâ&#x20AC;&#x2122;d like to share with us? I have had some very strange funeral requests. One gentleman wanted to a Viking style funeral, some have asked for Jedi ceremonies and one wanted his cremated ashes to be put in to a firework and let off at his wake! The Kitchen, Bedroom and Bathroom Specialists All aspects of building work eg: extensions, removal of walls etc,plastering, tiling, electrical & plumbing undertaken as we project manage your kitchen from start to finish. I P D M E N You have two minutes to find all the words of three or more letters that can be made from the letters above. Plurals are allowed, proper nouns are not. The 6 letter word will always be just a normal everyday word. Screen & Keyboard Replacements Customised Computer Tui�on Customised Computer Tuition Fully Mobile Service with FREEMobile collec�on & Delivery Fully Service with No Call out fees & FREE no obliga�on quotes FREE collection & Delivery Mac, iPhone & iPad repairs No Call out fees & FREE no Data Recovery/Backup/Restore obligation quotes Virus/Spyware/Malware removal Email&migra�on/Setup Mac iPad repairs Home WiFi Boos�ng • Computer Servicing Data Recovery / Backup / Restore So�ware installa�ons • Plus much more. Just ask! Virus / Spyware / Malware removal Email migration/Setup Home WiFi Boosting Computer Servicing Software installations Plus much more. Just ask! Learners community library Local resource launches dementia friends drop in service A local resource for parents, children, staff and professionals working with children/young people aged 0-19 as well as a developing local resource for those with Dementia and their carers. Learners Community Library provides equipment, materials, support and advice in an informal setting to parents/carers, SENCOs, professionals and others working with children and young people, aged 0-19, and children themselves in the surrounding area. The range of resources have continued to be extended from the original area of speech, language and communication (SLCN) to cover areas such as fine and gross motor coordination, behaviour management, social skills etc. There is now Dementia Friends Drop In to make better use of the resources for all as well as a new Help Point for Playlist for Life. How much does it cost to join Learners Community Library? psychologist, Autism Adviser, SPLD Advisers, Dementia Friends Champion and other professionals, as well as support from the volunteers at library sessions; •	Access software between sessions by arrangement and use of laptops •	Access Help Point for Playlist for Life; Chloe Noel aged 9 says: ‘I would •	Photocopy/print materials and laminate them recommend the library far and wide...’ (for as long as we have sufficient funds); •	Refreshments at LCL session; •	Access an electronic copy of the resource list; •	Identify items that you’d like to be ordered; •	A car park pass for library times (for as long as the hospital continues to support this) and more..... •	And more! Strength through connections, building business together. We provide networking events for both new and established small businesses. 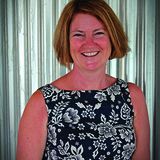 Charity of the year Introducing: Aspire Support Learn (ASL) About us My name is Michelle Toohil and I am the CEO and Founder of ASL. I’d like to tell introduce ASL to you. ASL offers supported day care and employment opportunities to young adults with learning and physical disabilities in and around Harlow. I felt there was very little choice in our area for young adults with additional needs especially employment opportunities, so I started ASL in February 2017. We have achieved so much within that time and made a significant difference to lots of young peoples lives. We are based in David Livingstone Reformed Church, Maddox Road, Harlow, Essex, CM20 3RW. Our tea room is a tea room with a difference! ASL offers work based training in our tea room kitchen and dining room to young adults with physical and learning disabilities, offering a pathway in to paid employment. Currently the majority of our young adults have Downs Syndrome, however we cater to all young adults with a vast range of additional needs. All the young adults attending ASL run the tea room themselves with support from ASL staff and volunteers, this includes arriving bright and early to prepare all our delicious fresh food in our kitchen, serving all our lovely customers and tidying up at the end of the day. www.databoxuk.co.uk Thorley Est.1999 1999 Thorley Park Park Est. Let’s talk about home boundaries! 1. Lock your doors and windows every time you leave your house or go to bed. With a PVCu or composite door with multipoint locking system: lift the handle, lock the door and remove the key. With a wooden door: make sure that you use the 5-lever mortise lock and the night latch or rim lock. Keep your keys away from your front door, out of sight and not left near a window but readily available in case of an emergency. Keep your money, gadgets and other valuables out of view from windows, doors or anywhere else they could be seen from outside. Leave lights on timers or radios in the rooms you use the most, to make it look like you are in. For further information about TV simulators and other security suggestions visit our website. If you have a burglar alarm, set it every time you leave the house or go to bed. embroidered shells edged with lace, and solid glass oversize potatoes! Wall pieces include cut out lettering, the positive and negative, a hanging made of raw sheep’s wool, fir cones and feathers, a felt piece worked until hard in places then embroidered, the lino matrix for a print and paintings which are three dimensional or light up. Altogether there is a great variety of shapes and textures to explore and enjoy. Music features too on Sunday 7th April at 4pm, when there will be a performance in the Project Space where visitors are invited on a journey through sound which provokes an emotional response. This will be an intriguing experience. for on-the-go lunch or supper. Wrap tightly in foil to Ready in 30 minutes. 1. Heat the oil in a large non-stick frying pan over a medium heat and fry the onion and garlic for 5 minutes until softened. Add the rice and chilli powder and stir-fry over a medium heat for 2-3 minutes. 2. Meanwhile, heat a cast-iron griddle pan over a high heat. Add the chicken and cook for 3-4 minutes, turning once until the chicken is seared and cook through. Add the peppers to the pan after 2 minutes and cook till soft. 3. Cut the cooked chicken into thin strips and stir into the rice mixture with the peppers. Season to taste with salt and freshly ground black pepper. 4. Warm the tortillas as directed on the packaging. Place a tortilla on a chopping board and spread with 1 tbsp of the salsa. Top with a quarter of the chicken and rice mixture. 5. Fold in the sides towards the centre then roll up tightly to completely enclose the filling. Repeat with the remaining ingredients to make four burritos in total. Serve the burritos halved, with lime wedges. TIPs: Use a 250g pouch microwave Mexican style rice instead of cooked long grain rice. Add to the pan with 2 tbsp water and stir-fry until piping hot. Finish off a meal with these creamy individual fruity cheesecakes. You can make them a day in advance. Ready in 40 minutes. get on your bike for isabel Hospice! Join Isabel Hospice and celebrate our 10th year of On Your Bike by using your pedal power to help local patients and families in Bishop’s Stortford and across eastern Hertfordshire. With 3 routes to choose from (25k, 50k, 100k) through the beautiful countryside, there is a ride to suit every age and ability. So get a team together to support Isabel Hospice! 25k - A beautiful circular distance through the picturesque countryside, taking in the pretty villages of Manuden & Stocking Pelham before heading back through Patmore Heath and Farnham. 50k - Starting on the same route as the 25k ride, this route takes you into the village of Clavering, on through Upper Langley Green, Anstey, Great Hormead and Brent Pelham before rejoining the 25k route just before Patmore Heath. 100k - This will follow the same route as both the 25k and 50k rides before splitting from the 50k route at Clavering. The route will then take you to Brent Pelham, down into Great Hormead and on into Barley. You will then cycle to Saffron Walden via Wendens Ambo before looping back round towards Clavering where you will rejoin the 50k route. How to Play Sudoku Fill in the grid so that every row, every column, and every 3x3 box contains the digits 1 through 9, with no repetition! Send your completed puzzle with your name and address to the CM23 office: 27 Church Manor, Bishop’s Stortford, CM23 5AF. First correct entry drawn on August wins! 10th May wins! goAlison to Stephanie of Dunmow Road Congratulations to ReaderHodds from Walnut Drive who won whoFeb/Mar won July’s cash prize Sudoku competition. the £25£25 cash prize competition. Thanks to everyone else who entered! We are a group of volunteers who want to make Bishop’s Stortford a tidier place. We welcome groups and individuals who share our vision to join us. If you can spare a couple of hours (or even one) why not get involved? Your help will really make a difference. Too Many T’s, Jim Bob - Sunday’s bill also features party rap duo Too Many T’s and Jim-Bob from Carter USM, fresh from a sell-out show at the Shepherd’s Bush Empire. ALSO: Other acts confirmed over the weekend include The Kubricks, A Band Called Malice (The Definitive Tribute to The Jam), Koasis (Oasis Tribute), Stortford Sound System (Local DJ’s) and O’Connell & Love, side project from Alabama 3’s Larry Love. ■■ Tue 9th April Isabel Hospice Coffee Morning Markwell Pavilion Everyone is welcome at the monthly coffee morning, 2nd Tuesday of the month in aid of Isabel Hospice. Time: 10.30am or contact: 01279 755320.
book via: www.nationaltrust.org.uk/ hatfield-forest ■■ Sat 13th April Clavering Spring Fayre in Aid of St Clare Hospice Clavering Village Hall, CB11 4QS With a whole host of pre-loved items on sale including furniture, clothes, toys, books, household items and bric-a-brac. Time: 11am-3.30pm, visit: www.stclarehospice.org.uk ■■ Sat 13th April Rural Ramble Easton Lodge, CM6 2BD A 1, 4 or 10 mile walk in the beautiful gardens of Easton lodge, in aid of the Helen Rollason Cancer Charity. All walks include a complimentary cream tea. Time: 10am-4pm, tickets: adults £10, child 5+ £5, family ticket £25. To register visit: www.helenrollason.org.uk or call 01245 380719. ■■ Mon 15th April Marquee event in aid of Isabel Hospice – A History of Women in the Garden Stocking Pelham Hall, SG9 OHT An amusing and informative talk by Twigs Way - well known garden historian. Time: 11.30am-5pm, tickets: £37.50, to include coffee and lunch with wine, visit: www.isabelhospice.org.uk ■■ Thu 18th April Bishop’s Stortford History Society Talk: – Hertfordshire & The Slave Trade Apton Centre Time: 7.30pm-9.15pm, £3 for visitors, visit: www. bishopsstortfordhistorysociety.org.uk/ ■■ Sun 21st April Easter Trail Gibberd Garden, CM17 0NA Children will have great fun following the Trail. Time: 2pm-6pm, entry: adults £5, children £1, visit: www. thegibberdgarden.co.uk ■■ Sat 27th April Little Hadham Farmers Market Little Hadham Village Hall, SG11 2BS The market promotes the best of local produce, and has a strong ethos of offering only items grown, bred, prepared or made by the stall holders as much as practically possible. Time: 8.30-11.30am. ■■ Sat 4th May Farmers & Craft Market North Street, Bishop’s Stortford Local produce & handcrafted goods. Time: 9.30am-1.30pm. ■■ Sat 25th May Little Hadham Farmers Market Little Hadham Village Hall, SG11 2BS The market promotes the best of local produce, and has a strong ethos of offering only items grown, bred, prepared or made by the stall holders as much as practically possible. Time: 8.30-11.30am. ■■ Tue 14th May Isabel Hospice Coffee Morning Markwell Pavilion Everyone is welcome at the monthly coffee morning, 2nd Tuesday of the month in aid of Isabel Hospice. Time: 10.30am or contact: 01279 755320. ■■ Fri 17th May Museum’s at Night Rhodes Arts Complex Join us in the museum as we take part in this nationwide initiative with our night time trail. Time: from 7pm, FREE, visit: www. 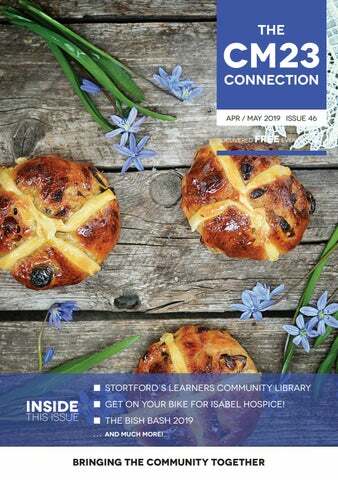 rhodesartscomplex.co.uk ■■ Sun 19th May On Yer Bike – for Isabel Hospice Bishop’s Stortford Rugby Club With 3 routes to choose from (25k, 50k, 100k) through the beautiful countryside, there is a ride to suit every age and ability. Time: 8am-4pm, tickets: adults £25, child £10, book via:www.isabelhospice. org.uk/support-us/events ■■ Sun 19th May Nature in the Gardens Easton Lodge, CM6 2BD Join us to see the wildflowers and learn about the wildlife in the Gardens. Time: 11.30am-5pm, tickets: adults £4.50, child under 16 FREE, visit: www. eastonlodge.co.uk ■■ Sat 25th May Take a Walk Down Memory Lane Rhodes Arts Complex As we take you on a guided walk through Stortford we encourage you to stop us at places that hold special memories with you and share them with the group. ■■ Sat 25th May to Sun 2nd Jun Get Hands on with History: Myths & Legends Audley End House, CB11 4JF Come and hear Dr Vainen Schuchdes Forges, the travelling Cure-All Salesman, at Audley End this half term for a myths and legends themed storytelling session. Time: 11am-5pm, book via: www. englishheritage.org.uk ■■ Tue 28th May Magical Woodland Elves & Fairies 2019 Hatfield Forest, CM22 6NE Explore the forest looking for hidden fairy doors and make your very own woodland wand. Time: 10.30am & 1pm, tickets: £7, book via: www.nationaltrust.org.uk/ hatfield-forest ■■ Tue 28th may Herts & Essex Boundary Flower Club 60th Diamond Anniversary Demonstration: Sixty Sparkling Years Manuden Village community Centre, CM23 1EH Time: 6.30pm welcome drinks and canapés followed by Demonstration at 7.30pm, tickets: £18 on the night or email: herts&essexboundaryflowerclub@ yahoo.co.uk ■■ Fri 31st May Marigolds Jazz Club Presents: Portrait of Cannonball featuring Tony Kofi & Andy Davies Harlow Cricket Club, CM17 0DJ Tony Kofi sax, Andy Davies trumpet, Alex Webb piano, Andrew Cleyndert bass, Alfonso Vitale drums with special guest vocalist Deelee Dube. Time: 7.30pm, tickets: £10 on the door, contact 01279 414174 or 421763, www.musicatmarigolds.co.uk Watch out for many more events in our next issue or on our Facebook pages. new venue and new image Stort Valley Rotary Club now meet on 2nd and 4th Tuesdays of each month, 7 for 7.30pm at The Coach and Horses, Thorley Wash CM23 4AS, and the meeting takes the form of dinner and a speaker. We welcome guests to these meetings and if you are interested in joining us at any of the events listed below please contact Gwenda Deal on 01279 863194 or gwendadeal@ outlook.com. Whilst every care has been taken to ensure that the data in this publication is accurate, the Editor cannot accept any liability to any party for any loss or damage caused by errors or omissions. All adverts are published in good faith. The CM23 Connection is an independent organisation. The magazine and content, including all in-house artwork, advert design and editorial, remains the copyright of the Publisher and under no circumstances may be copied or reproduced in any format without the prior consent of the Publisher. © 2019 The CM23 Connection / Connection Magazines / Lorraine Perry. All rights reserved. PLUS MUCH MORE IN STOCK TODAY!